It’s 2016, and I thought my days of using a fax machine were well behind me. It turns out, however, that Hillsborough County in Florida allows mailed-in ballots and faxed-in ballots, but not emailed-in ballots. And due to the unreliability of regular post (I find that a lot of letters and packages simply never arrive these days), my options are down to fax or using an international delivery service like UPS or FedEx. But since those two each cost over $50 to send in my ballot, I opted to go the more archaic route: fax. Since any major hotel in Shanghai has a “Business Center” (商务中心), I figured going to a nice hotel would be a good place to fax a document. Sure, it wouldn’t be the cheapest faxing option, but it would certainly be much less than $50, and I could get the help of the professional staff of a five-star hotel. After calling ahead to the Jing’an Hilton and the Jing’an Shangri-La Hotel (both within walking distance of my office) to make sure both offer international fax services, I set out Friday afternoon to fax in my ballot. Reality was a bit more complicated. 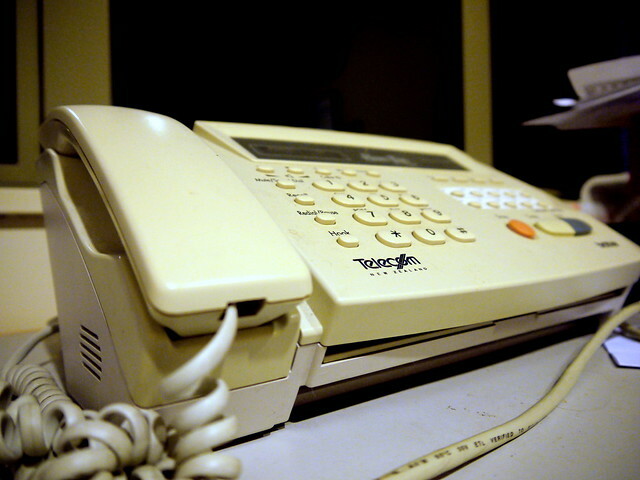 The staff of both places (as well as a third, Yan’an Hotel, which I tried out since I was walking past it anyway) were actually not very familiar with using a fax machine, much less sending an international fax. Every trip resulted in a polite affirmative from staff that they could fax the document, followed by lots of calls on how to send an international fax, multiple attempts, and ultimate failure. The worst part was the way the fax machine’s “failure to send” message result was worded: “no answer or the line was busy.” “Or”?? Seems like in this case, the result could be clearer. I began to suspect that the fax machine was only on during business hours, and also decided to take a friend’s suggestion and use an app. So I scanned my document, got it on my phone, and used an app called Genius Fax to send it in Friday night at around 8:30pm. Success! I honestly thought that going the more human route would be easier and more certain, but when it comes to using an increasingly outdated technology, which relies on another increasingly outdated technology (international telephone calls), it just didn’t work out. I still don’t even know for sure if the main issue really was simply one of business hours and time difference, but at least the fax went through in the end. If you can’t vote by email, vote by fax. You have to waive your right to secret ballot to do this, but at least you can be fairly sure your vote has been received. If you use the fax option, use an internet-based service. I used Genius Fax, but friends on Facebook also recommend FaxZero and HelloFax. If you’re voting from abroad and you’ve received your ballot, it’s not too late to vote. So even though today is the official voting day, you still have time, especially if you choose the fax option. Votes from abroad can decide a close election! Hopefully this helps somebody. Get your vote in! Coming from the state of Florida, I felt additional pressure to be sure to vote in this presidential election, and getting that “successfully received” message from the app was quite a relief. I did a research by going through all of Trump-related reports on China Daily since August. And here is what I found. Out of 711 articles under the section of “US and Canada”, how many times has Trump’s name made headlines? 11. One of them, technically wasn’t related to the election per se, it went Trick or Trump: The Donald, Pizza Rat among top Halloween costumes. And just out of curiosity, how many times has Panda Bei Bei? 4. Not bad, Bei Bei! Trump is a comic star in Chinese media. Many people, mainly from two groups, wish he will be the next president of the U.S. The second group believes that the best gift you can have is a stupid opponent. Typical comment is “I can’t wait to see how badly Trump can mess the U.S. up.” Though Trump has many hostile sayings about China, his capacity of doing anything of real harm is questionable. It’s worth noting that this poll is from February 2016. (Anyone know of a similar, more recent poll?) See the full article for more details: What If Chinese People Could Vote for the President of the United States? > What impression does the average Chinese person have of North Korea? > Is it similar to the rest of the world or do they have a different view considering the relation of their government with North Korea? > I’m not sure about the “average” Chinese person, but nearly all the Chinese people I know feel a range of emotions toward North Korea that would include embarrassment, shame, pity, contempt, and outright hostility. It’s like a nasty dog that was already a family pet long before you were born: once upon a time, it wasn’t so crazy and bitey, and actually helped scare off would-be burglars and you were even kind of proud of what a tough little sonofabitch he was. 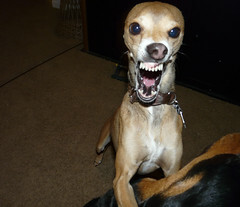 Now he’s always barking, straining at the leash, trying to bite the neighbors (and ruining your relations with them), shitting all over the place, and costing you too much to feed. See the question for the full answer (all two paragraphs of it). > School’s out. I’m so happy! Lao Hu, hurry up! > OK. Just packing up my book bag. Have a good April Fool’s Day, 童鞋们 (that’s cutesy talk for 同学们). 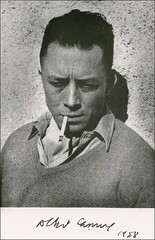 In my experience, Albert Camus (阿尔贝·加缪) is not very well-known in China. > There are two kinds of Communists: the arrogant ones, who enter the fray hoping to make men out of the people and bring progress to the nation; and the innocent ones, who get involved because they believe in equality and justice. The arrogant ones are obsessed with power; they presume to think for everyone; only bad can come of them. But the innocents? The only harm they do it to themselves. But that’s all the ever wanted in the first place. They feel so guilty about the suffering of the poor, and are so keen to share it, that they make their lives miserable on purpose. Hmmm, I wonder what the Chinese would think about that. The other day as Xiao Wang (my ayi, a 32-year-old woman from the Harbin area) arrived, I was watching the news. 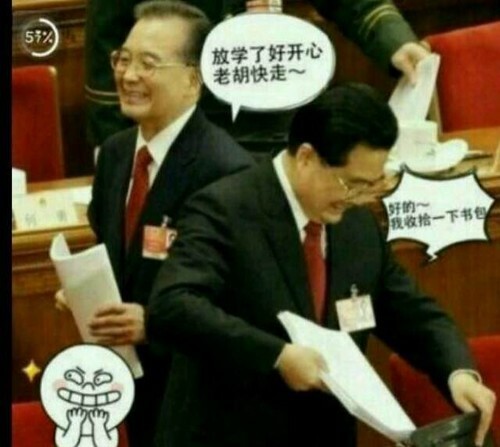 Wen Jiabao (温家宝) was making some statement or other. Xiao Wang didn’t pay any attention. She started fixing dinner. Thus ended the conversation on politics. A reader of mine is working on her thesis, and she needs help. She’s looking for chengyu or other Chinese quotes to add some flavor. She needs your help ASAP! Leave your suggestions in the comments. 1. Introduction. In this section I point out that a lot of what is written about China these days as a rising superpower is vague, inaccurate or in some cases alarmist. I explain my basic justification for the thesis, which is to see where China stands in relation to what a superpower is. So I’d like to put something at the start that would suggest that things are not always what they seem, something about the problem of exaggeration etc. 2. What is a superpower? In this chapter I present the development of world power from the inception of the term superpower in 1944 up to the present day, and use this to chart how the concept of superpower has changed. Then I discuss a few theories about the current world order, and on the basis of that decide what forms of power a state must possess in order to be a superpower. These are grouped into military power, economic power, political power, and domestic cohesion, which is the basis for the next four chapters. The only things I can think to use at the start of this chapter are 水落石出 or 画龙点睛. Of these the first is probably better, but I’m sure there’s others out there about power or strength, and the importance of power. 4. Economic power. I look at the growth of the Chinese economy, and how that gives them international power. There’s also a bit about the importance of indigenous technology, and a sound industrial base, as well as something on the impact of multi-national corporations. I found a quote by Deng Xiaoping encouraging people to push ahead with market socialism: 无论黑猫白猫，抓到老鼠就是好猫. But again, any suggestions of chengyu about money, the power of money etc are very welcome. suitable chengyu about the power of politics. 6. Domestic Cohesion. In this chapter I argue that states cannot project power on an international level if they are not stable at a domestic level. So I look at China, especially with reference to the income divide that is building between the wealthier coastal provinces and the inland provinces, the common occurrences of civil disturbances/protests in recent years, and the problem of uniting a nation when market socialism goes against the tenets of communism. These are contrasted with rising nationalist sentiment as a way of uniting the state, and the attempts by the leadership to slow growth in the eastern and southern provinces while fostering growth inland, so as to counteract the growing inequality. I’m sure there are lots of phrases in the general style of an apple looking lovely on the outside but not necessarily on the inside, or some such sentiment. 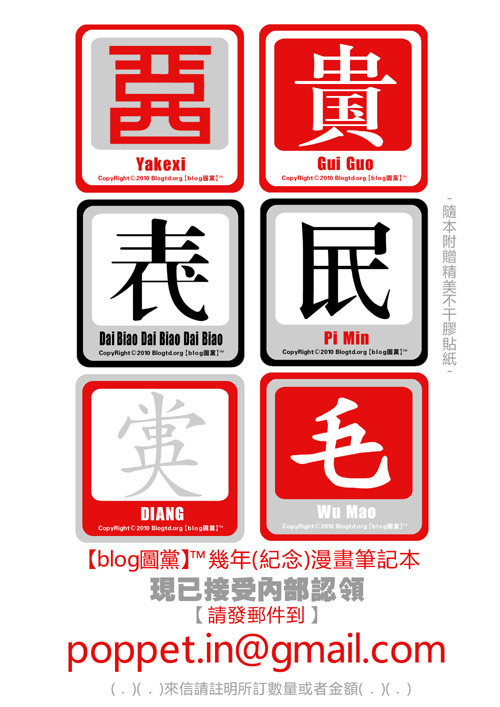 The only one I know is 驴粪蛋表面光 – although I like it a lot, it’s probably a bit cheeky! 7. Conclusion. A general summing up, my basic conclusion being that although China has or is developing great military power, is an increasingly central economy in the world, and is more and more being treated as a political power, it probably does not yet have these types of power to an adequate extent to merit it being labelled a superpower. And its main challenge in coming years will be to maintain domestic stability. I suppose 画龙点睛 would probably do here, although something to do more with looking at everything as a whole would probably be better. I didn’t have my usual Intensive Reading Chinese class today. Yesterday in class someone from the administration came and passed out special letters of invitation to the “First China Zhejiang Academic Festival” (首届中国浙江学术节). We were told if we went our taxi fares would be reimbursed, and we’d get a free lunch. We all decided to go. Last week I was walking near West Lake with Russell and we passed a huge lavish meeting hall-type building. We weren’t sure exactly what it was. It turned out to be the Provincial People’s Congress Hall (浙江省人民大会堂), and that’s where the “Academic Festival” was. Today I showed up 10 minutes late and was greeted on the steps of the building and given a ticket and a special pass to wear around my neck (it said “特邀代表证”). Then I was ushered to my seat along with a classmate who happened to show up at the same time. I was seated on the ground floor of the “show room,” but there were balconies on the second and third level which could be accessed by escalator. There were massive video screens on either side of the stage, showing a zoomed-in view of the “important” people seated on stage. This was their day to shine, to blab on and on about boring crap. You know they’re bullshitting when you hear them mention the “Three Represents” over and over. The “award ceremony” was kinda amusing. This troop of girls in red qipao was parading around with plaques, handing them to the appropriate recipients. At one point sashes were handed out to outstanding scientists, but there weren’t enough to go around, and one guy didn’t get one, on stage, in front of everyone. Some Chinese guy behind me was calling out loudly and repeatledy, “HA! They’re short one!” Tactful. Next the main speaker launched into an intensely boring and long-winded talk on DNA. I really don’t get it. Why was he talking about DNA? The talk was too basic for anyone in the field of biology, but a little too in-depth for anyone not. The guy was going on and on about Watson, Crick, Franklin, and Pauling, and all the details of the discovery of DNA’s double helical structure. It would have been interesting to hear a 5-minute talk on the subject, as I was familiar with it (my major freshman year of college was microbiology — I once wanted to go into geneetic engineering) and it was kinda interesting to hear it in Chinese, but this guy went on for an hour and a half with his neverending PowerPoint presentation! People were nodding off left and right. I did my best to keep my own drowsiness from getting too obvious, but I think I failed. The talk did provide lots of vocabulary. I got to hear words like “double helix” and “cytoplasm” and “chromosome” in Chinese. Word of the day: 蛋白质 – protein. As you might expect, the word came up again and again, and I just think it’s a funny word. “Protein” in Chinese, translated literally into English, is “egg white essence.” That’s kinda funny in itself, but I can’t help also associating it with 蛋黄南瓜, a Chinese dish made with pumpkin and egg yolk (“egg yolk” translated literally from Chinese is “egg yellow”). What redeemed the entire ordeal was the meal afterward. It was in a nice restaurant, and it was really good. Crab, shrimp, mussels, chicken, duck, tofu, asparagus, lotus, dates, nuts, and other stuff I can’t remember — all really good. Also, the waitresses had this habit of refilling my wine glass pretty fast, so I was well on my way to very happy by noon! I had to teach class at 1:30. I was very cheerful in class. Some people say there are no certainties in life, but those people would probably admit that there are certainly very high likelihoods. For example, if you turn on the TV in China, there is a very likelihood that you’ll be tuning in to crap. Still, raised on television as we are, foreigners in China will at times find themselves watching anyway. Whether we do it “to get a feel for the propaganda machine,” or out of some kind of sick masochistic pleasure, or simply because we’re starving for a little mindless TV action, we do watch broadcast TV from time to time. I very rarely watch TV in China (or in the U.S.), but for some reason I turned on the TV while I was eating lunch in my apartment today. I actually saw something rather interesting. The show that caught my attention was CCTV’s Dialogue. This show is infamous among expats in China because it’s so often so bad. The show is in English, and often it’s a number of Chinese people discussing some serious issue in English (which is kind of weird). There are also foreign guests at times, and if the topic is a controversial one in which the foreigner represents an opposing viewpoint, the host, Yang Rui, can be extremely smug and downright condescending. What was interesting about today’s show was the guest, Jing Jun, a Chinese professor of sociology from Qinghua University. 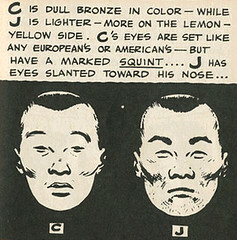 That he was educated in the United States was made clear by Jing Jun’s fluent English. (The same cannot be said for Yang Rui.) The topic was, of course, SARS. This time the angle was “the sociological implications of SARS.” What impressed me was the frankness with which Jing Jun discussed Beijing’s handling of SARS, even on CCTV, the national television station. Jing Jun stated in no uncertain terms that Beijing lied to the people and tried to cover up SARS cases in the beginning, and was only forced to come out with the truth when the lies became too apparent to the people. This is certainly no secret to anyone (the Chinese people not excluded), but I found it impressive that such a view would be expressed from such an obviously well-educated Qinghua University professor on the national television station. After Jing Jun expressed this opinion, Yang Rui quickly changed the topic. During the interview, Jing Jun also expressed the realistic view that SARS could be controlled, but was not going to go away anytime soon. > Y: We know that the people’s deputy ID card is a symbol of a deputy’s responsibility and power, have you ever used yours in a practical situation? > W: Yes, one example is that I used my card to stop a car that belonged to a high-ranking army officer. The car was driving into the bicycle lane at the time. Seeing that, I used my bicycle to stop the car because I felt I had the responsibility to protect ordinary citizens. So I produced my deputy ID card and said to the driver that he should stop and back out of the lane because the lane is for cyclists. And then this driver, a young man, got out of the car and swore at me, “Are you asking for trouble or what, old woman?” Later I filed a formal complaint in which I noted down the plate number of the car and described what had happened. About a month after that I got a phone call from an army officer, presumably the owner of the car. He said he wanted to come over to apologize and he did. And then two weeks later I got a call from that driver. He came over and pleaded with me to remove that line of his swearing from my complaint saying that otherwise he would have to leave the army and go back to where he came from. I told him, “Well, young man, I can’t do that, it’s not right for you to ask me to remove that line for that would mean I was slandering you.” But I did write a letter to that officer saying that I hope this young man would not be demoted from the army as a punishment. Young people sometimes make mistakes and they need a chance to correct their mistakes. > Y: Some people think American democracy is closest to what democracy really means. Do you agree? Do you think we should follow the American style of democracy? > W: I don’t really think so. Ten people might have ten different definitions of democracy. Each country has its own culture and history. We Chinese have our own idea of freedom and democracy, and Americans have theirs. Each has some problems. That’s why we always have to improve. Did you hear about this story? “Foreigners in China Stage Small Anti-War Protest” from washingtonpost.com. There are several things about this article I find interesting. First, the protest consisted of “several dozen foreigners.” In a city of millions of people, only “several dozen foreigners” had the balls to protest a war that pretty much all of China disagrees with?? To be fair, it’s true that the foreigners won’t get in nearly as much trouble (if any) for protesting, whereas any Chinese participants would probably face real repercussions. Still, I think it’s funny, imagining a group of foreigners protesting in Beijing. I wonder if they did it in Chinese or English… Also, it’s kind of funny that the “brief protest” was pretty much over as soon as it began. But still, I admire and support the protesters. It should be done. Second, the protest was “organized through mobile telephone text messages.” Too funny. Anyone who’s been in Eastern China for very long knows how widespread the phenomenon is (see Wang Jianshuo’s take on it and the Sinosplice poll related to it). So of course foreigners are in on the cell phone texting too. But organizing protests by SMS? I can just imagine someone, all justly fired up over the war, angrily typing in, “5-5-5 3-3 8 1-1-1 7-7-7-7 (LET’S) 7 7-7-7 6-6-6 8 3-3 7-7-7-7 8 (PROTEST)….” You get the picture. Last, China “has not allowed public anti-war protests for fear of harming ties with the United States.” Wow. I’m impressed by that. I’m not saying it’s good to suppress peaceful protest, obviously, but I appreciate Beijing’s commitment to good relations with the U.S. There are some prudent people in power over here. It’s a stark contrast to what’s passing for leadership on the other side of the world in certain superpower nations. But I’ll end by saying that I support those protesters in Beijing, even if I find the story a bit comic. And while I’m not happy with the decisions made that put them there, I support the allied troops of the U.N.-defying nations who are now serving their countries on Iraqi soil. These two questions are pretty unscientific, I know. The students’ answers are very subjective. Before the questions, I made sure they understood what I meant by “care.” Still, interesting results. A trend is uncovered. Obviously, the word “care” is crucial, because what does that mean? One can easily say one cares, but then that “caring” doesn’t actually manifest itself in any actions. Also, this is not secret ballot. When students declare they don’t care, they do so publicly in front of the whole class as I count hands. There’s less of the “herd mentality” than you would think, however. You do get one or two people defying the rest of the class and voting how they really feel at times.